End financial untouchability for freedom from poverty. “Vish-chakra se gareebon ki aazadi ka parv” – celebration of liberation of the poor from a poisonous cycle. 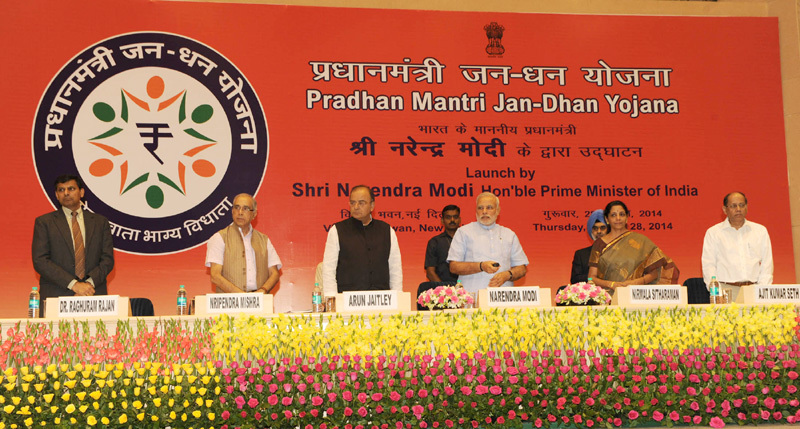 A record unprecedented in economic history – 1.5 crore bank accounts opened in one day. Expressing satisfaction at a number of records being broken today, the Prime Minister said the nationwide success of the enrolment drive today would give confidence not just to the officials of the Department of Financial Services and banking sectors, but also to officers across the Union Government, that they can successfully achieve the goals that they set for themselves. “Never before would insurance companies have issued 1.5 crore accident insurance policies in a single day. Never before in economic history would 1.5 crore bank accounts have been opened in a single day. Never before has the Government of India organized a programme of such scale – over 77,000 locations – with the participation of so many Chief Ministers, Union Ministers, Government and bank officials.” He said the success is an inspiration for achieving new heights. 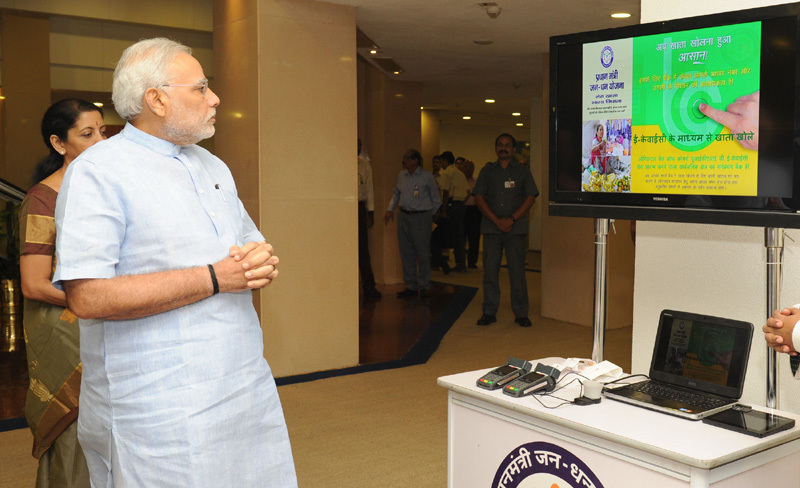 The Prime Minister referred to the five beneficiary couples who had received account opening kits in today’s event at Vigyan Bhawan, and said the ladies appeared to have dressed for a festival. He said they knew that there could be no bigger festival than the opening of a bank account for empowering women. The Prime Minister said when banks were nationalized in 1969, it was done with the objective of bringing people into the economic mainstream. But that objective had not been achieved till date. After 68 years of independence, not even 68% of India’s population had access to banking, he added. He said it is easy for the rich to get a loan at low interest rates. But the poor are forced to seek loans from money-lenders at five times the rate charged to the rich. Is it not the responsibility of the banking industry to provide banking access to the poor, the Prime Minister asked. 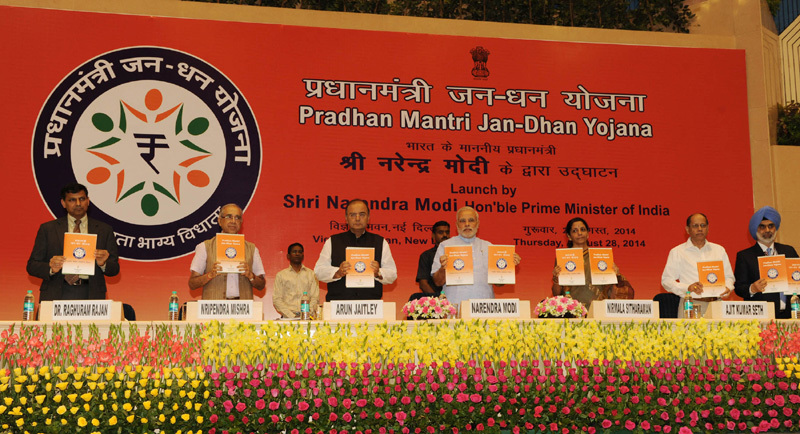 The Prime Minister referred to the ancient Sanskrit verse: Sukhasya Moolam Dharma, Dharmasya Moolam Artha, Arthasya Moolam Rajyam – which puts the onus on the state to involve people in economic activity. “This Government has accepted this responsibility,” the Prime Minister said.